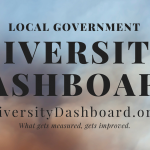 The ELGL Diversity Dashboard is the first ever data collection on the gender, race, age, and veteran status of local government chief administrative officers and assistant chief administrative officers. Access the Diversity Dashboard online to learn about local government leadership diversity in your state. ELGL distributes a demographics survey to all local governments with a chief administrative officer (CAO) or assistant chief administrative officer (ACAO) in the United States and Canada. Local governments do not need to be members of ELGL to complete the survey. The survey is electronic via PublicInput. Data is compiled and shared without names and contact information into an OpenGov dashboard. OpenGov has configured their tool to share the demographic data of CAO and ACAOs in various formats including charts and maps in the Diversity Dashboard. Continuing the Conversation: Hello?! Is This Thing On? We Did It! Diversity Dashboard Fully Funded! Engaging Women in Public Service – It’s a movement!